Buffalo Bill and the Pope—The Indians Deeply Impressed—Wild Roman Horses Subdued in Thirty Minutes by the Cowboys—Unrestrained Debate in the Italian Parliament, which made Crispi Bring Matters to Crisis—The Need of Rules Regulating Discussion—Arrival of the American Fleet—Dr. Loring, our Minister of Portugal, in Naples. Perhaps the very acme of William F. Cody's ("Buffalo Bill's) honors were reached on the 3rd inst., when the Pope held a grand function in the celebrated Sistine Chapel in honor of his Holiness' ascension of the papal throne. It was a great and an imposing occasion, when all the Cardinals and other high ecclesiastical functionaries, the Diplomatic Corps to the Holy See, the complete rank and file of the noble Palatine and Swiss Guards, in their full and picturesque uniforms; and the flower of the clerical party in the shape of Roman Princes, nobles, and "upper tendom" in general were present, and gave distinction to the scene. Bison William (who is a Roman Catholic) some days before had asked Cardinal Rampolla, the papal Secretary of State, to be so kind as to present his corps of cow-boys and red-skins in a private audience to the Pope. These red-skins, etc., have set all Rome crazy by their Wild West performances. The Cardinal replied that the party was too large for a private audience, but that they might see Leo XIII. on the day he celebrated his twelfth anniversary as Pontifex Maximus. The newspapers state (and newspapers always tell the truth, you know—like George Washington, "they can't tell a lie"), that "Buffalo Bill" clinched the matter by saying that he had been the means of the conversion of several of the heathen Apaches, Nez-percé's, and other native Americans in his Wild West. I suppose that your readers never heard of Mr. Cody in the missionary line before, so I hasten to be the first in English to proclaim it from the authentic source above mentioned. However that may be, it is a certain fact that the tall, fine looking "Buffalo Bill" was invited with a few of the leading white persons in his troop to occupy conspicuous seats in the Sistine Chapel, while more than one hundred and fifty sons of the forest of full feathers, war paint, and wild picturesqueness, were assigned to equally conspicuous places (though outside of the Sistine Chapel) in the Sala Ducale. This Ducal Hall has served great purposes in the past, and is used on some important occasions in the ecclesiastical and Vatican economy. It was here that the Popes in former times gave audience to princes, and here that new Cardinals received their consecration. So our red-skins (some of whom are Princes—for the word means the same thing as chiefs) had a place of more than usual importance. They, indeed, on the 3rd of March, attracted more attention than anybody else, except the Pope himself. Thousands of people in the space before St. Peter's and the Vatican awaited the coming and the departure of the painted North Americans. What was the impression on the Indians themselves? An eye witness says, that when these Wild-men, so accustomed to perform daily before vast audiences in London, Paris, Naples, and Rome without visible emotion, saw the triple crowned venerable man (who is the religious chief of millions) borne in his resplendent State chair, upon the shoulders of men; when they saw him surrounded by plumed officers in gorgeous uniform, and attended by ecclesiastics, some in sombre and some in bright scarlet flowing robes; when they beheld the other by-standers in the Sala Ducale, prostrating themselves before the so-called chief of the religious world, they, for a moment, stood with open-mouthed astonishment, their breasts heaved, and, then, they, too, made obeisance as the brilliant and awe-striking procession passed by them. No sooner had the Pope entered the Sistine Chapel than one of the braves was found to have completely fainted away, and medical assistance had to be immediately brought to him. That night, one of the Indians, a strong man of thirty, suddenly died. Whether the emotions of the day had any thing to do with it I know not. As to the Pope himself, it is said, that he looked upon these Indians from the borders of civilization with a curiosity akin to fear. Now whether curiosity, religion, or business prompted this visit of Buffalo Bill and his cow-boys and Indians to the Vatican on this great Papal function, deponent sayeth not. But one thing I do know, that is, it was an immense réclame for the "Wild West," and if Barnum himself had managed the thing he could not have succeeded better. 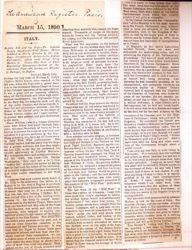 All the papers of the Kingdom had telegrams telling that William F. Cody, the genuine Buffalo Bill, was to be assigned a conspicuous place at the solemn anniversary, and that his troop of cow-boys and Indians would be given a place in the Vatican; and the next morning, after the grand function was over, every paper had elaborate telegraphic acccounts of the presence of the "Wild West" performers at the Vatican. But it is easier to tame horses than men. The same week that the wild steeds of the Roman Campagna were subdued in the Wild West arena, there was a tussle in the Italian Parliamentary arena, which was equally notable if not quite so successful. 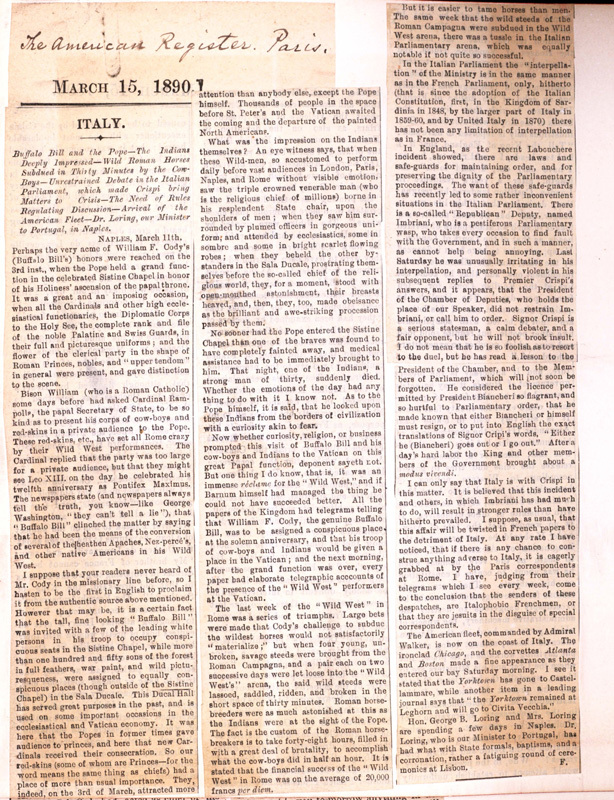 In the Italian Parliament the "interpellation" of the Ministry is in the same manner as in the French Parliament, only, hitherto (that is since the adoption of the Italian Constitution, first, in the Kingdom of Sardinia in 1848, by the larger part of Italy in 1859-60, and by United Italy in 1870) there has not been any limitation of interpellation as in France. In England, as the recent Labouchere incident showed, there are laws and safe-guards for maintaining order, and for preserving the dignity of the Parliamentary proceedings. The want of these safe-guards has recently led to some rather inconvenient situations in the Italian Parliament. There is a so-called "Republican" Deputy, named Imbriani, who is a pestiferous Parliamentary wasp, who takes every occasion to find fault with the Government, and in such a manner, as cannot help being annoying. Last Saturday he was unusually irritating in his interpellation, and personally violent in his subsequent replies to Premier Crispi's answers, and it appears, that the President of the Chamber of Deputies, who holds the place of our Speaker, did not restrain Imbriani, or call him to order. Signor Crispi is a serious statesman, a calm debater, and a fair opponent, but he will not brook insult. I do not mean that his so foolish as to resort to the duel, but he has read a lesson to the President of the Chamber, and to the Members of Parliament, which will not soon be forgotten. He considered the licence permitted by President Biancheri so flagrant, and so hurtful to Parliamentary order, that he made known that either Biancheri or himself must resign, or to put into English the exact translations of Signor Cripi's words, "Either he "Biancheri) goes out or I go out." After a day's hard labor the King and other members of the Government brought about a modus vivendi. I can only say that Italy is with Crispi in this matter. It is believed that this incident and others, in which Imbriani has had much to do, will result in stronger rules than have hitherto prevailed. I suppose, as usual, that this affair will be twisted in French papers to the detriment of Italy. At any rate I have noticed, that if there is any chance to construe anything adverse to Italy, it is eagerly grabbed at by the Paris correspondents at Rome. I have, judging from their telegrams which I see every week, come to the conclusion that the senders of these despatches, are Italophobic Frenchmen, or that they are jesuits in the disguise of special correspondents. The American fleet, commanded by Admiral Walker, is now on the coast of Italy. The ironclad Chicago, and the corvettes Atlanta and Boston made a fine appearance as they entered our bay Saturday morning. I see it stated that the Yorktown has gone to Castellammare, while another item in a leading journal says that "the Yorktown remained at Leghorn and will go to Civita Vecchia." Hon. George B. Loring and Mrs. Loring are spending a few days in Naples. Dr. Loring, who is our Minister to Portugal, has had what with State formals, baptisms, and a corronation, rather a fatiguing round of ceremonies at Lisbon.